I hope that Stephen Spielberg really has fun with the Blackhawk movie, and embraces its comic book roots rather than make it a straight war film. Wonder Woman and Captain America have proven that both genres can be successfully mixed. is it too much to hope for cameos by other DC war heroes like The Unknown Soldier? Ha! The link to issue #2111 yesterday had me thinking for a moment that this was a direct sequel to Spidey's time-travel team-up with Tarantula. I'd love to see Spielberg have the Blackhawks fight the War Wheel! I agree with your comments about Spielberg's Blackhawk. I'm even hoping that there could be a Wonder Woman cameo! I was a fan of the Blackhawk reprints in the 60s, even though I recognized at the time that all of the main characters (including the titular leader) were nationalistic stereotypes. I'm confident that Stephen can work with those stereotypes by either demolishing them, subverting them, lampshading them, or by some other means. @TJS: It might just be that. Who knows? 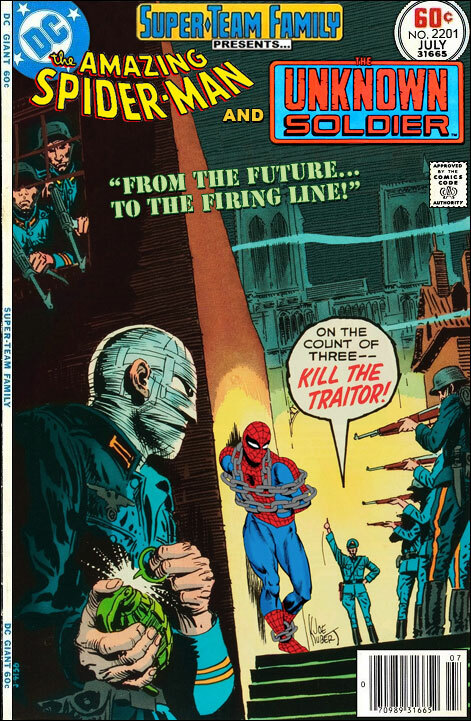 Maybe some future cover will show Doctor Fate, the original Green Lantern, or some other Golden Age hero working to get Spidey back to his own time! I think Blackhawk would lead to re-interest in Sgt.Rock for the movies. Back in the 80s and 90s Bruce Willis was considered for the role. I would like for there to be interest in an Unknown Solider movie but I would like to see a modem CIA/spy thriller rather than setting it in WWII. The last Unknown Soldier mini-series (back in the early 2000's by Garth Ennis.I have not read the last series by Joshua Dysart) implied the Unknown Soldier is an identity passed down over the years to different people so I think it could really be set in any time. I think Sargent Rock appearance is a natural for a Blackhawks movie but I really, really hope that Steven Spielberg does not ruin this franchise making it something completely different with same name. That Spidey in chains, reeeal familiar. Musta been from 'way back when I were a comics fan. I think that's from the 1960's cartoon. The episode where he got put in a giant glass of water by Blackwell the Magician's lovely assistant (disguised as the Green Goblin).